The year is 1831. Down the murky alleyways of London, acts of unspeakable wickedness are taking place and no one is willing to speak out on behalf of the city's vulnerable poor as they disappear from the streets. Out of these shadows comes Hester White, a bright young woman who is desperate to escape the slums by any means possible. When Hester is thrust into the world of the aristocratic Brock family, she leaps at the chance to improve her station in life under the tutelage of the fiercely intelligent and mysterious Rebekah Brock. But whispers from her past slowly begin to poison her new life and both she and Rebekah are lured into the most sinister of investigations. Hester and Rebekah find themselves crossing every boundary they've ever known in pursuit of truth, redemption and passion. But their trust in each other will be tested as a web of deceit begins to unspool, dragging them into the blackest heart of a city where something more depraved than either of them could ever imagine is lurking . . . 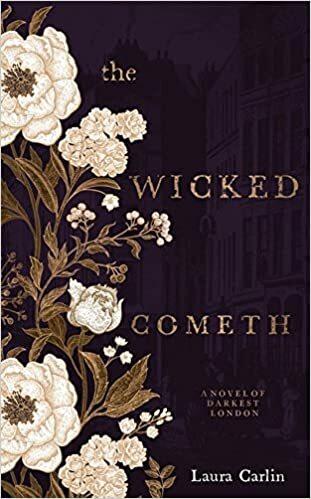 I found the start of The Wicked Cometh by Laura Carlin very atmospheric. Set in the London of 1831,it talks about the reported disappearance of Master Hogget. He is not the only person to have gone missing recently. We are then introduced to Hester and her life in much reduced circumstances. The story revolves around Hester, Miss Rebekah and their concerns about the missing people. Through a stroke of luck – ill or otherwise, Hester has an accident and is looked after by Calder who is Rebekah’s brother. He is a physician. As part of her care Hester takes lessons from Rebekah. The sexual tension between the two women is obviously very early on and forms an important part of this story. Rebekah’s family who are a little unusual are the other strand together with the missing people. The basic story idea here is fine with me and is well fleshed out. I found this perfectly readable however it seemed to take a while to get going. All in all I found this a good enough read though I was not blown away by it. I’d say this was better than 3 stars though not 4 stars to me but I’d be happy to read another book by this author.